Roman Riches Classic Slot Guide & Review - Casino Answers! 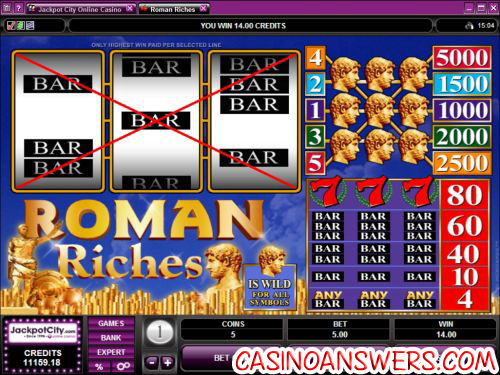 Roman Riches is a 3-reel, 5-line multi-coin slot machine from Microgaming. You can play Roman Riches at any online casino using the Microgaming casino software platform, including River Belle Casino and 777 Dragon Casino. To start playing Roman Riches, first select your coin value. You can pick $0.25, $0.50, $1, $2 and $5 as your coin value. This will also be your per line bet. Next, click the “Bet One” button to choose how many coins you want to bet (up to 5). If your coin value is $1 and you bet five coins, your bet will be $5. Also, for each coin you bet, you will activate another payline. When you are ready to spin, hit the “Spin” button to play. If you want to play the maximum 5-coin bet and spin the reels, hit the “Bet Max” button. The Roman emperor symbol acts as a wild symbol. It can substitute for any other symbol in the game to complete a winning combination. It is also the top fixed jackpot in the game, worth up to 5000 coins. Payouts on the Roman Riches slot machine are (1/2/3/4/5 coin payouts in parenthesis when applicable): 3 of any bar symbols (4), 3 single bar symbols (10), 3 double bar symbols (40), 3 triple bar symbols (60), 3 7’s symbols (80) and 3 Roman emperor symbols (1000/1500/2000/2500/5000). The value of the maximum bet is that if you get three Roman emperor symbols on the fifth payline, you will win 5000 coins. You can only win 5000X your bet with the Roman emperor symbol if it is on the fifth payline. The fifth payline is only active when you play with the 5-coin maximum bet. If you hit three Roman emperor symbols on the first through fourth line, you will still win a significant amount. Hit the “Expert” button on the bottom of the screen and you can now use Roman Riches autoplay mode. If you only want to play five or ten spins, the buttons are right there and you can quickly launch the autoplay mode with those quantities of spins. If you want to use the advanced autoplay mode, click the “Autoplay” button. Here you can determine the number of spins (5 to 500), number of seconds between spins (quarter of a second to one and a half seconds), to stop once all spins are complete, to stop when the Roman Riches jackpot is won, to stop if a win exceeds or equals (from $25 to $2500), to stop any win you receive and to stop if your credits increase or decrease by (any value you choose from $25 to $2500). You may cancel the autoplay mode at any time. Roman Riches is easy how to learn how to play, provides a substantial top fixed jackpot and some other good possible wins as well. We think many players will also enjoy the Roman theme that the slot machine has. To play Roman Riches, you can take advantage of the 100% up to $100 signup bonus offered at River Belle Casino. I’m an American. Why can’t I play Roman Riches at any online casino? Players located in the United States are unable to play Roman Riches at Microgaming online casinos due to the UIGEA. To read more about the UIGEA, please read our Unlawful Internet Gambling Enforcement Act article. For another Roman-themed slot machine, we recommend you try Caesar’s Empire at Club USA Casino. What’s a relaxing slot machine game to play? What is the Rome Rich slot machine?